Google Maps just got a little bit more powerful. The iOS and Android versions of the mapping application now include real-time crowdsourced traffic and road hazard notifications from Waze. For those who are not familiar, Waze is a crowdsourcing app for traffic. When you come across an accident, a road hazard, a closing or a police trap, you can use Waze to share that information with other users. Google bought the company in June, and now includes these real-time traffic notifications as part of the Google Maps experience. The new Waze reports will be an addition to the traffic warnings already present on Google Maps as reported by state and local transportation authorities. 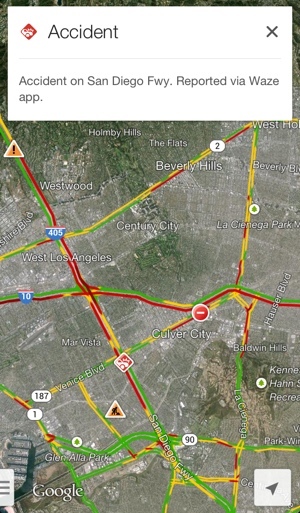 Not all Waze reports will display to users of Google Maps, however. Comparing the two applications side-by-side, it appears that Waze reports accidents, incidents and construction to Maps, but not specific traffic jam warnings or police trap info. Over the past few years, mapping applications have gotten much, much better at reporting real-time conditions. Google’s continuously updating, color-coded traffic information helps provide to-the-minute specificity to your daily commutes. Now, with Waze at Google Maps’ side, you’ll be able to see more information about new traffic incidents and problems, even before they cause the 10-mile backup you’ll be sitting in on the way home from work. You don’t need to update Google Maps to start seeing the Waze updates – they should appear automatically on the current iOS and Android versions of Maps. If you would like to participate and contribute your own crowdsourced traffic reports, the Waze app is available for download from the App Store and Google Play. Just remember to be safe – don’t Waze and drive!